Senior Tory figures have criticised a north-east MP after he was caught up in a police incident at an exclusive Westminster bar. Officers from the Metropolitan Police swooped on Strangers Bar on the parliamentary estate at around 11pm on Tuesday following complaints of “sexual touching”. 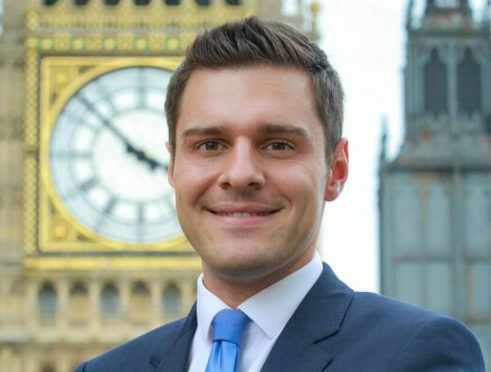 Aberdeen South MP Ross Thomson is believed to be one of three men spoken to by police in connection with the incident. Scottish Tory deputy leader Jackson Carlaw said the allegations, if proven, were “completely unacceptable” and fell well below the standards expected of an MP. Speaking following First Minister’s Questions at Holyrood, Mr Carlaw said he became aware of the allegations from social media reports on Wednesday afternoon. He said: “Like others I became aware of alleged behaviour by one of my parliamentary colleagues in the House of Commons on Tuesday night from social media reports yesterday afternoon. “Inquiries are ongoing. However I know enough to say that the alleged behaviour is completely unacceptable and falls well below the standard I think any of us would expect of any elected representative. As of yesterday evening neither Mr Carlaw nor Ruth Davidson had spoken to Mr Thomson and the Aberdeen South MP had not made a public statement on the incident. Conservative Party HQ said the matter had now been referred to the whips’ office, which handles internal party discipline. A Tory source said Mr Thomson’s welfare was “first and foremost” in the minds of whips and Westminster colleagues. A party spokesman told the Press and Journal that no further comment would be issued on the matter at this stage.